The Bosch PR20EVSK is a fairly old budget wood router released in 2004 that over years has got a lot of positive reviews and recommendations from experts. It is an affordable routing solution with a very interesting set of features that speak to both beginners and professionals alike. This model sports a variable speed control, a fixed aluminum base as well as a fairly powerful motor for both casual routing and even some "heavy-duty" wood routing. Additionally, it can be mounted to a router table like the Bosch RA1181 for even more accuracy and ease of use. If you are fresh in the market for a wood router, let's see how well the features of this product translate to benefits. If you want to buy a wood router, here are some reviews that I recommend to read such as Bosch 1617EVS, Porter-Cable 7518, Makita RT0701C, DeWalt DW618PK, DeWalt DWP611PK, Bosch 1617EVSPK. The motor in this Bosch wood router is what makes it great value for money. It is not the most powerful we have reviewed, but on a price to performance basis, it is excellent. It is rated at 5.6 Amp which is powerful enough for even the most demanding wood routing tasks. It can cut through both softwood and hardwood like butter. Its power ensures that you get an accurate and clean cut throughout the routing process. 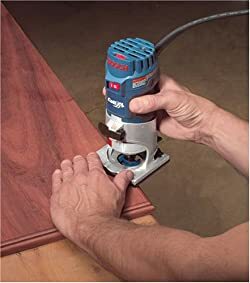 Furthermore, equipped with the right router bit, it can even be used for edge trimmings in soft metal. This is a lot of versatility that a simple thing like 5.6 Amps motor in a router can bring. Of course, it is not as powerful as more expensive and premium grade routers like the Bosch 1617EVS with a 12-Amp motor, but considering its low price, it is definitely an agile wood router that brings a lot of value to the table. What we also like about this motor is the presence of the "Constant Response" circuitry which is a way of ensuring that the router never under powers under load. This is normally a feature found in more premium router models from Bosch but we are glad to see it included in the Bosch PR20EVSK. As almost a standard feature in wood routers these days, the Bosch PR20EVSK has a variable speed control that does a decent 16,000 to 35,000 RPM. The lowest 16,000 RPM is ideal for carving through tough material like hardwood while the highest 35,000 RPM is better suited for soft material and where a polished and clean cut is desired. By having a variable speed control, you are able to adapt the speed of the Bosch PR20EVSK to the type of material you are working with. Specifically, the density of the material. Some material will require a high speed while others work best with the lower speed. You will need to do some experimentation to see which speed works the best for you. Furthermore, this Bosch wood router allows you to lock the speed for more convenience. That means that you become more productive when working with this router as you do not have to constantly readjust the speed. The Bosch PR20EVSK comes with a fixed base that easily fits the slim motor pack with an audible click sound. In addition, there is only one way to fit this router in the fixed based so there is no possibility of accidents or ruining your work with a wrongly positioned router. It is solidly built from rugged aluminum and it is machine-finished which means that it is perfectly flat so as to provide extreme accuracy during your routing. This is especially helpful when held as a handheld wood router as it gives you more control and maneuverability. Furthermore, the aluminum construction means that it is very durable and will last a long time. The collet accepts only a 1/4" which shows that it is mostly for refined work. We would have preferred more versatility with a 1/2" collet but a 1/4" collet still does the job and will accommodate industry-standard 1/4" router bits with a maximum diameter of 1-5/16". Furthermore, what we like about the Bosch PR20EVSK is that the collet has a self-releasing mechanism which means that it is very easy to change router bits in seconds. The front spindle lock can be unlocked or locked with only one wrench, but you can also use a secondary one if you prefer more tightness. Bosch also provides two wrenches for preference. This allows you to change the fixed base or reposition the router bit height quickly and easily. Talking about adjustments, this model allows you to get a very accurate router bit height of 1/64" increment with the fixed base. The bit depth can also be locked in position so as to offer more versatility when doing sensitive work. Lastly, the variable speed control dial at the back of the unit makes it very easy and intuitive to adjust your speed on the fly. Quick-Clamp: The quick-clamp mechanism makes it very easy to fit the motor pack in the fixed base. It also makes it equally easy to remove and change fixed bases. All you need to do is pull the lever, remove the motor pack and push it down again for a tight fit. Angle-Cord: The power cord is angled at the back of the motor pack and does not get in the way. This provides more maneuverability and visibility when routing as a handheld device. Rubber Grip: The molded rubber grip makes the device very comfortable to hold over long hours. It is also anti-slip for added convenience. Out of the box, you get a few accessories. This includes a straight edge guide, the aluminum fixed based, 1/4" collet, drop-forged collet, two wrenches and a solid and a durable plastic carrying case. Of course, you also get the users manual that makes it easy to learn about the in and out of the Bosch PR20EVSK. This is quite a reach set of accessories delivered with this fairly budget wood router. We like what we see. The Bosch PR20EVSK is offered at one of the most competitive prices we have seen. It cannot possibly compete with more expensive and professional grade wood routers like the Bosch 1617EVS or DeWalt DW618PK, but it has an excellent price to performance ratio which makes it great value for money. In its own price range, it is one of the best wood routers out there mostly because of its solid build construction as well as accuracy that it can deliver on the job. We also like the fact that Bosch offers a one-year warranty with this product. You can't ask for more at this price. Variable speed control of 16,000 to 35,000 RPM. Allows you to adapt your routing to a wide variety of materials. Quality aluminum fixed base that is also durable. Works with a maximum of 1-5/16" router bit diameter that is very versatile. Easy to adjust router bit depth to a very accurate 1/64" increment. 5.6 Amps motor is not the most powerful we have seen and most is suited for working with wood and edge trimmings. Will under-perform when working with metal. The Bosch PR20EVSK offers a lot of versatility and performance at an affordable price. If you work mostly with wood and need a router for edge trimmings, mortices, dados and other casual routing tasks, this model will definitely deliver. It is not suited for working with metal but as far as wood is concerned, it is still an agile wood router. It also has user-friendly features that make it excellent for beginners learning the trade. Furthermore, you can even add it to a compatible Bosch plunge base if you already have one. Even more so, you can easily fit this model to a router table like the Bosch RA1181 or Bosch RA1171 for even more accuracy on the job. Therefore, we recommend this model for those on a strict budget and require an accurate and dependable wood router.